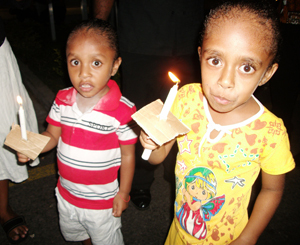 A candlelight memorial service to remember the victims of the recent disasters in Australia, New Zealand and Japan was held at the University of the South Pacific’s Laucala campus in Suva last night. Vice-Chancellor Professor Rajesh Chandra said the university was deeply saddened about the devastating loss of lives in Queensland, Christchurch and Japan. “USP feels the pain and suffering in these three countries,” he said. Chandra said the university had a longstanding friendship with the three countries and it was very appropriate for USP to reach out during their time of loss. About 250 students and staff took part in the memorial, which began with a symbolic march from the Japan-funded ICT Centre to the AusAID lecture theatre about four blocks away. Japan’s Ambassador Yutaka Yoshizawa, Australia’s Acting High Commissioner Kristy Moneil and New Zealand’s Trade Commissioner Peter Lund were present at the service led by USP’s chaplain Father John Bonato. Yoshizawa said he was impressed with the USP community for organising the memorial, and its campaign to help provide relief to those affected. Atama Nakalevu, a postgraduate diploma student, said it was only right that the USP community reach out during this time of suffering. “As a Christian, I believe we all belong to one family, so when one of us is suffering, we should all share in that sorrow,” said Atama, after signing the condolence book opened at the memorial. Lucy Kapp, an undergraduate, said she was overwhelmed by the service and hoped whatever little help USP could offer would be of significant help to those affected. Rowena Tutu, another student, said the memorial opened her eyes to the fact that “we are not alone in this world”. “Somewhere, everyday, there are people who pray for us,” she said. The service marked the beginning of USP’s campaign, entitled USPHope, to fundraise for scholarships for 10 students from the three countries. The scholarships would be offered to “students who have lost everything”, said Deputy Vice-Chancellor Dr Esther Williams. “While we would like to help more if we could, the Vice-Chancellor has agreed that we offer university places to up to 10 students from each of the three places for the remainder of the academic year, 2011,” she said. Details of the assistance will be finalised by the university’s international office, she said. Minnie Edmanley and Zhiyad Khan are second-year journalism students at the University of the South Pacific. Wansolwara is the award-winning journalism student newspaper published by the University of the South Pacific.